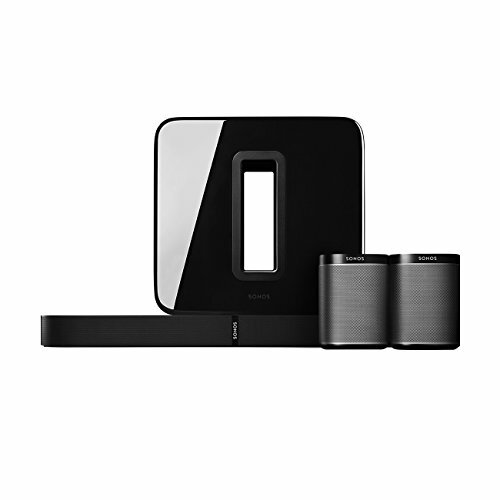 The Sonos 5.1 Home Theater Digital Music System is ideal for all homeowners who’re looking to purchase an all-in-one sound system. Featuring a playbase, a high-quality sub, and two Play:1 speakers, this music system incorporates everything you’ll ever need. The Sonos 5.1 Home Theater Digital Music System works on Wi-Fi which makes sure that you don’t have to deal with wires for playing music in different rooms. When you can play one song across all rooms, it also gives you the added freedom of playing different songs in different rooms. So, if you’ve got the budget, and are willing to purchase a top-rated music system, have a look at the Sonos 5.1 Home Theater Digital Music System review. When it comes to Sonos, it is one of the premium manufacturers in the field of audio systems. Having produced a series of high-quality music systems in the past, this one comes with all the hi-tech features which you could expect from a product of this brand. A type of sound bar, the Playbase comes handy for all those homeowners who never mount their TVs on the wall. According to Sonos research, almost 70% public fall into this category which means that this component comes handy for a vast majority of customers. With a height of little more than two inches, this component is basically designed to be placed under your TV. It is made of hard plastic, and as long as the TV’s weight is under 75lbs, this device can bear its weight without any hindrance. Even if you place your TV on a stand, you can still connect this component with it as long as there is enough space to accommodate the Playbase. Coming towards its functionality, this speaker makes use of a total of 10 internal drivers, six of which are actually midrange drivers. When the former comes handy to enhance the high-frequency sound, the latter does all so well when it comes to picking delicate sound levels. Then comes the three tweeters along with a one separate woofer so that you’ll never have to compromise on the quality of the sound. For controlling the Playbase, the manufacturer has provided touch controls on its front side. If you want to pause or play the music, you just have to tap above the logo of this company. Tapping left will decrease the volume and tapping right will increase it. Furthermore, if you want to play the next song in your playlist, all you’ve to do is to swipe from left to right and vice versa. There is a button provided on the left side of this device which needs to be pressed if you want to connect this component to the Wi-Fi. And finally, all it takes is an optical cord to connect this speaker to your own TV. So, if you’re looking for the speaker which is not only easy to set up but, at the same time, also produces a compelling-quality sound, this is where the Playbase from Sonos gains top marks. The latest product from Sonos, the Sub is basically a wireless subwoofer which is designed exclusively to complement the existing Sonos setup in your room. Connecting this device with the Play:1 speakers is fairly easy. Just plug in the Sub to a nearby power outlet before pressing a button on the front side of this unit. Afterwards, it will automatically connect itself with the Sonos speakers which means you don’t have to worry about all those wires which are part and parcel of other subwoofers. There is also an Ethernet input if you insist on making a wired connection with this particular component. As per its performance, it does well to pick up the lowest frequency sounds so that you’ll always have perfect quality sound with the help of this sound system. Another impressive component in this music system, the Sonos Play:1 speakers are another wireless component of this music system. Their compact dimensions make them easy to fit in even the tiniest of real estates and can be easily connected with the existing Sonos devices via their wireless connectivity. For accessing these speakers, you need to install the Sonos app on your iOS or Android smartphone. Once you open the app, it will immediately recognize the surrounding speakers, and you just have to select your home-based Wi-Fi system. However, if the app fails to recognize the Play:1 speakers, you can always take help from the Ethernet cable which comes included with your purchase. Even though the Sonos Play:1 looks tiny for the first time, it comes with two custom-built drivers and two extra Class-D Amplifiers. Despite the compact dimensions, it is still more than capable of producing a high-quality sound. The Sonos 5.1 Home Theater Digital Music System is quite easy to set up. First of all, bring out the Playbase and attach it to your TV via an optical cable. Then take out the sub and plug it into a nearby power outlet. After receiving power, it will automatically connect with the Playbase as no extra cables are required for this purpose. Lastly, unbox the Play:1 speakers, place them in their desired position and connect with the rest of the music system via the Wi-Fi system. The Sonos 5.1 Home Theater Digital Music System consists of a Playbase, one Sub, and a couple of Play:1 Speakers. When the Playbase does well to enhance the sound of your TV, it’s up to the sub-woofer for bringing out the bass. Furthermore, you can use the Play:1 speakers as left and right channels and when all of these devices can be controlled via Wi-fi, it saves you a valuable amount of space in your living room. The Sonos 5.1 Home Theater Digital Music System comes head to head versus the Bose SoundTouch 300 Soundbar Bundle due to their similar price range. When you can operate the former music system with the Sonos app, it comes down to the SoundTouch app for controlling the latter. But apart from their price range, this might be the only similarity between both these models. In the Sonos Music system, you can stream songs with Wi-Fi, but there is no Bluetooth option in this purchase. This is where the Bose SoundTouch Bundle is a bit more flexible as it comes with both Bluetooth and Wi-Fi connectivity. Coming towards their sound quality, the Sonos 5.1 Home Theater Digital Music System performs much better in this regard. The reason behind it is that the Sonos Playbase comes fitted with six mid-range drivers as compared to four mid-range drivers of the SoundTouch Sound Bar. Then there are three dome tweeters in the Playbase as compared to just one one of them in the Sound Bar. Moreover, you’ll get an additional subwoofer with the Playbase, but there is no such option with the Sound Bar. Another basic difference between both these models lies in their subwoofer’s output. When the Sonos sub can be connected wirelessly with the Playbase, the SoundTouch Sound Bar makes use of a 3.5 mm cable for the same purpose. The Sonos 5.1 Home Theater Digital Music System can transform your living room into a live-movie theater, a football stadium or anything else which you want it to be. As compared to other music systems in its category, this product produces a much crisper quality sound thanks to its high-quality Playbase. Additionally, its subwoofer comes with a fully wireless connection which means fewer wires to worry about in your living room.